FOUNDED IN 2010 and based out of Santo Domingo Tonalá Oaxaca, Proyecto Raíces (the Roots Project) takes a grassroots approach to improving the quality of life of elders living in extreme poverty by providing them with food, shelter, and care. The founders of Proyecto Raíces saw a need within the elder community in Tonalá; a need that I also observed. The majority of the elders I met live in impoverished circumstances, often with little or no daily human interactions; some practically abandoned due to the high levels of out-migration to Napa, California (from this particular community). These elders have spent their lives working in the fields, in their homes, in construction; some have even crossed the northern border at some point in their lives to work legally as some of the first “Braceros” (manual laborers). The theme of out-migration is deeply woven into the community’s story and is often the cause of the separation of entire families for years on end. 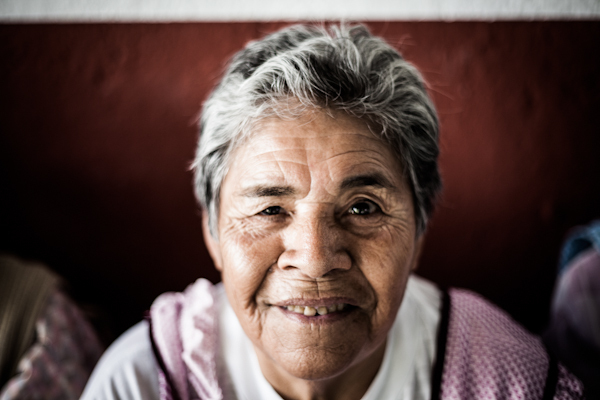 Given the difficulties faced, the activities and initiatives carried out by Proyecto Raíces are changing the way elders are treated and viewed in Tonalá, as well as increasing their quality of life. Each face and each set of hands photographed reflects an entire life story of an elder with between 68 and 94 years of diverse experiences, adventures, and stories. The hands of the elders illustrate a connection among generations while showing the physical expression of the passage of time, as well as change as a constant in life; most of us will one day look at our hands and see a similar image. Amalia is 76 years old and lives alone. She cares for her older brother and is extraordinarily motivated and independent. She has a daughter who also lives in the village and who is always trying to convince Amalia to move in with her; Amalia prefers to stay in her own home and take care of her older brother. Cirenia is 68 years old. She lives with her niece, as her brother and his family reside in California. It is difficult for her to get around due to her painful arthritis. She has little contact with her family residing in the states. Guadalupe is 80 years old and lives in Atenango, a smaller village near Tonalá. She lives alone and works selling fruits and vegetables in surrounding communities on their market days. Azucena has children who cannot, or choose not, to support her. She lives alone in Tonalá where she rents a small a room. She receives the government aid via the program “70 y mas,” which is minimal, amounting to about $50 dollars a month. She sells seeds in the market when she can to earn some extra money. Tia Chelina is 83 years old. She lives alone on property owned by her brother. She doesn’t have any children, but has lots of nieces and nephews living in Napa, California. She loves to dance and is always in attendance at the different “bailes” (dances) in Tonalá … dancing to her beat! Josefina is 86 years old. She is a widow and lives with her niece who is also a widow. Josefina is very active in the church and part of Acción Catholica (Catholic Action), a group of women who organize different events and prayer groups in the community. Luisa is 79 years old and she has three children, one of whom she lives with in the community. She used to live with her sister until she fell ill. Luisa recently had an operation on her eyes as part of a government program, a free surgery that restored her vision. Carmelita is 91 years old. She has children in Tonalá, but they do not take care of her. However, one of her daughters recently returned to Tonala from the United States to care for her. Carmelita’s daughter currently works washing clothing to bring in funds for them both. Hermila is 83 years old. She doesn’t have any children and for many years lived with her sister. When her sister passed, she was forced to move out and now lives alone. Her nephew and his family, who just moved back to Tonala after years of living in Houston, Texas, are now looking after her. Two of her nephew’s children were born in the US and are part of a growing group of migrant children returning to live in Mexico. Margarita is 95 years old. She lives with her son who works as a street sweeper in Tonalá, for which he receives $250 USD a month, not nearly enough to make ends meet for both him and his mother. Margarita has a candy shop that she has operated for over thirty years and where she continues to work. Many community members who have immigrated to Napa, California, still remember her as “Tia Margarita” who sold them candy as children. Ricarda is 85 years old. She lives with her son and his family in Tonalá. Her daughter supports her as much as she can, but it’s difficult as her only income comes from selling juice at a local market. Doña Ricarda is known for having made the best empanadas de calabaza (squash empanadas) that she sold in the market. She was forced to abandon her business about two years ago after falling ill and losing the ability to walk on her own. Don Francisco is 94 years old. He was remarried later in life, to a woman who took care of him until she fell ill and her children took her to live to Mexico City with them. He has been sad about the separation, but he is lucky to have his son and daughter-in-law who now take care of him. He was a singer in his youth and would be the first one to tell you that he loves to party! He was a campesino (farmer) his entire life, working and living off of the land. Doña Catalina’s age is unknown, but thought to be in the mid-80s. She was an orphan and was raised by her aunt. Her husband was also an orphan who was one of the first braceros (manual labor immigrants) to go to the US from Tonalá. He returned to Santa Catarina, a neighboring town of Tonalá, after working in the states for a few years. He saw Catalina at a fiesta and from that moment he was certain he would marry her, and felt an especially strong connection after finding out she was also an orphan. Catalina lived a beautiful life with her husband who was a very hardworking man. As Catalina puts it, when her husband passed away, her life changed forever. She has one son who is unable to take care of her. Despite her struggle, Catalina has a beautiful spirit and always ends a sentence with a smile and a dash of laughter. Proyecto Raices is currently in the process of becoming a formal Civil Association, or A.C. (Asociación Civil) as it’s referred to in Mexico; their website will also be up and running soon. Special thanks to Proyecto Raíces founders, Alejandra and Karen for their support in documenting the stories of these incredible elders.